Hi guys. 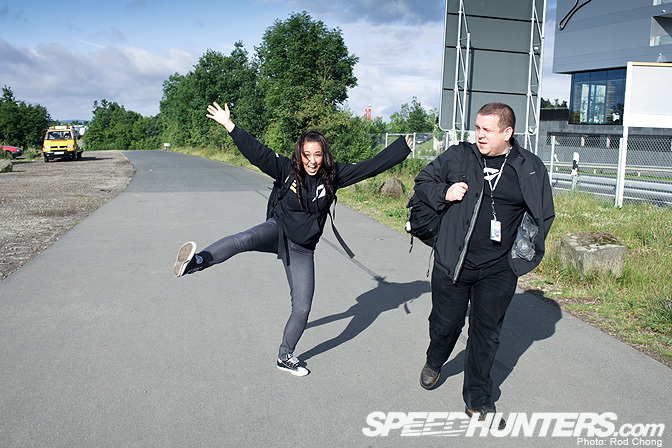 I hope you're enjoying our Nurburgring 24 Hour coverage! Tonight it's my turn to prep the Behind the Scenes coverage, as Paddy and Andy are still at the track shooting. 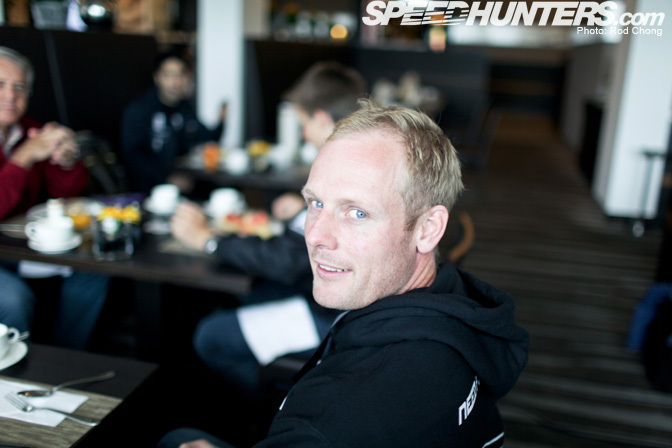 Organizing our Speedhunting trip to the Nurburgring 24H isn't straight forward. Compared to other events, this is on a whole other level of magnitude. So I've made a point to pace myself. I haven't even ventured out to shoot the Nordschleife yet, so far it's Paddy and Andy Blackmore who've been taking care of this. Instead, I've been concentrating on sticking to the paddock, pitlane and GP track area. There are a huge number of photos to look at so let's get started! …Yesterday started out with the delivery to our hotel room of several boxes of our new custom Touge Automotive Team NFS outfits. It took us almost an hour to sort the clothes out! I'm well pleased with the designs. Kudos to Gareth at Touge Automotive! 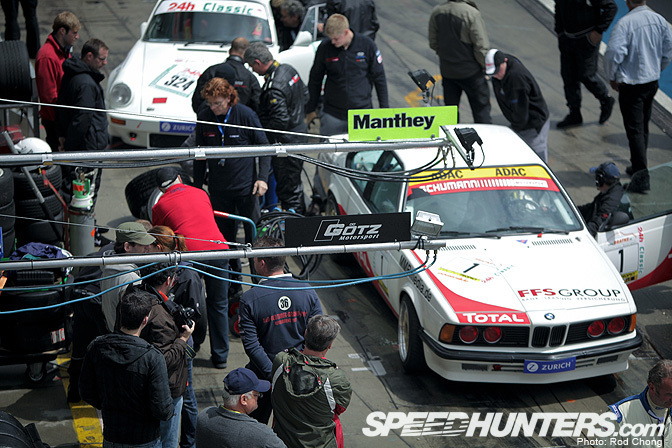 This was Andy Blackmore's first visit to the Nurburgring. 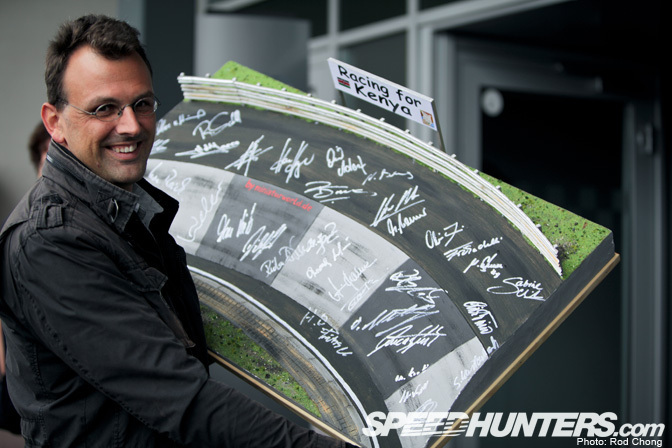 We've managed to pry him away from his work on Need for Speed The Run in Vancouver to help with our N24 coverage. 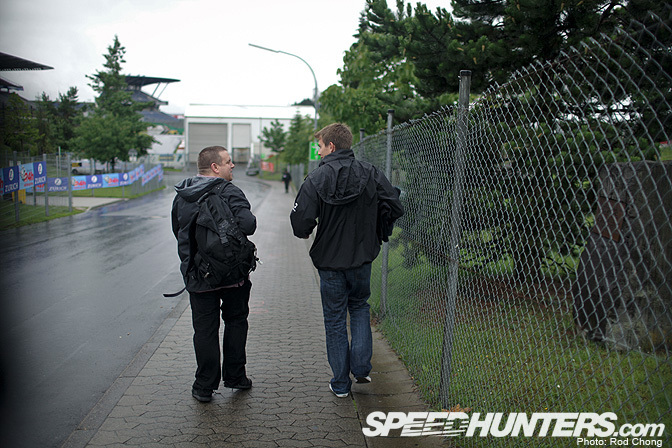 Arriving on site, we checked in with the Schubert Motorsport crew before promptly getting stuck in a rainstorm. In order to freshen up, we decided to head to the Lindner hotel for some food. 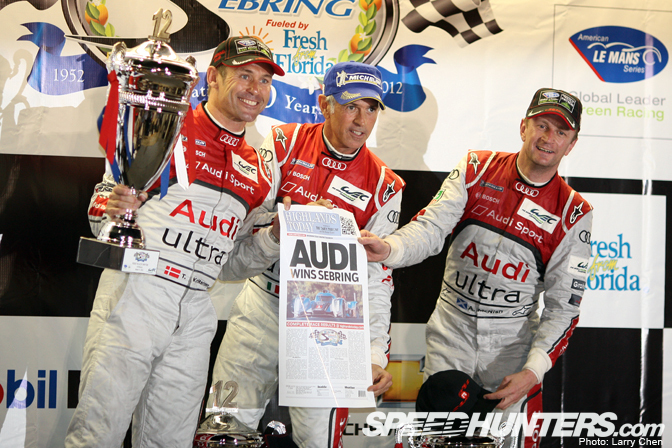 Along the way, Andy and Tommy Milner took some time to chat about his recent Le Mans victory. Outside the Linder hotel, VW had a bit of a Golf GTi display going which includes this mint Mk1 example. Nice! Walking into the hotel I spotted this baby Auto Union silver arrow. Not sure what this is for… kids? It was good fun to catch up with Tommy to get the low-down on his Le Mans GTE Pro victory with Corvette Racing. Watch out for a blog post in the coming week or so. Our next step was to head over to deal with the Press Accreditation, which is conveniently located at the Döttinger Höhe. 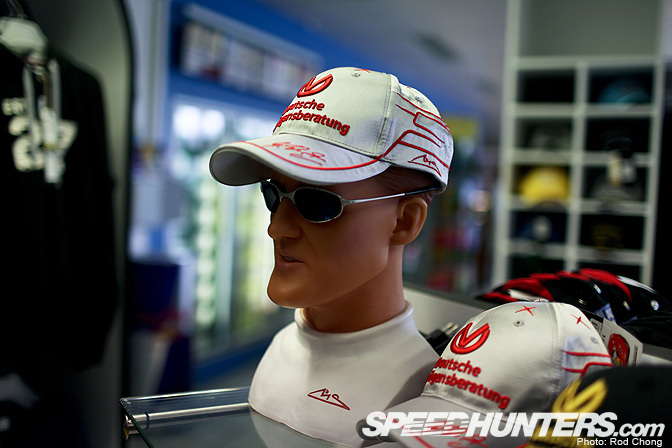 …But it contains one of the most amazing die cast shops on the planet. … As there are die cast models for sale here that I know for certain I will NEVER see in a model shop anywhere, ever again. This creates a mild sense of panic TBH! 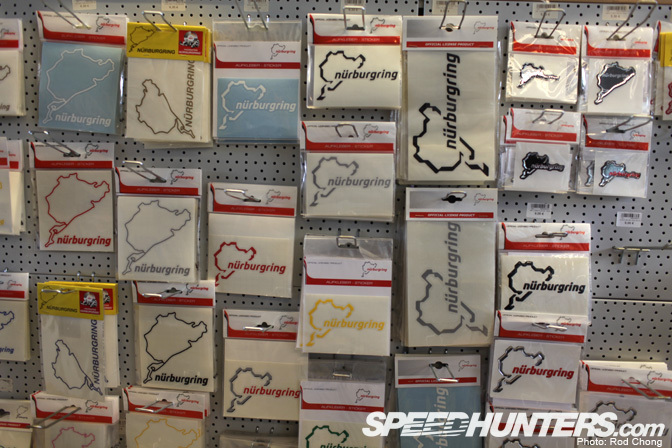 What ever your taste in racing, you will find your poison here. And in vast quantities. I'll be back with a full report about the Döttinger Höhe later, but what I can say is that that Kremer K4 model in the centre of this shot is now mine. Today we had a new person join our N24 motley crew: our Formula D NFS Electro Lounge DJ. Miki Taka had just flown in from San Francisco. The morning drives are quite enjoyable I have to say. In all my travels I don't think I've ever experienced such billiard table smooth roads anywhere! 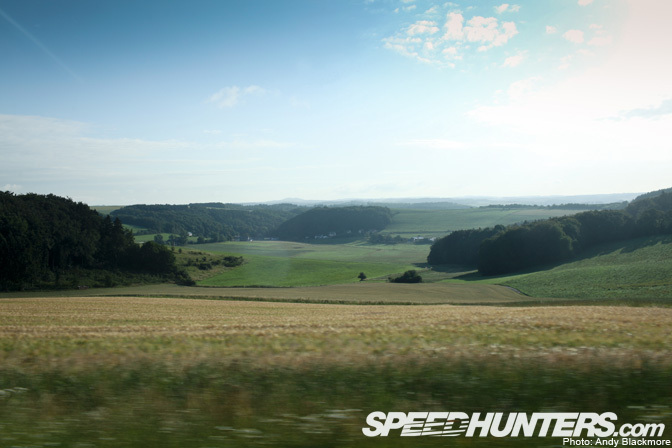 This part of Germany is absolutely stunning. This was the scene that greeted us this morning. No that sky is not a Photoshop! This is Miki's first trip to Europe, so she's feeling rather enthused hahaha. We then met up with Edward Sandstrom and Tommy Milner at the Linder hotel for a spot of breakfast. 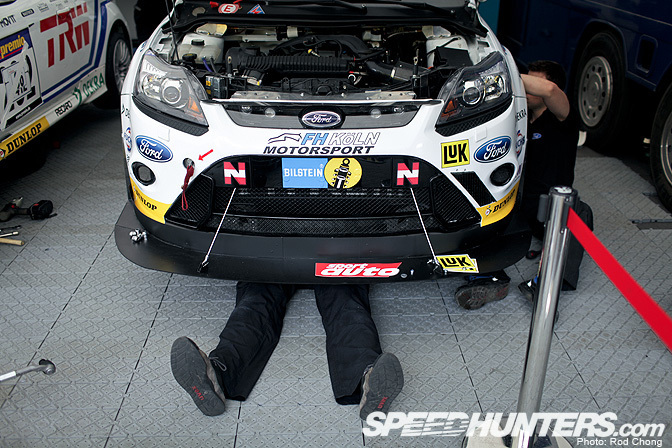 Next up, it was time to check in again at the Team NFS Schubert Motorsport setup. 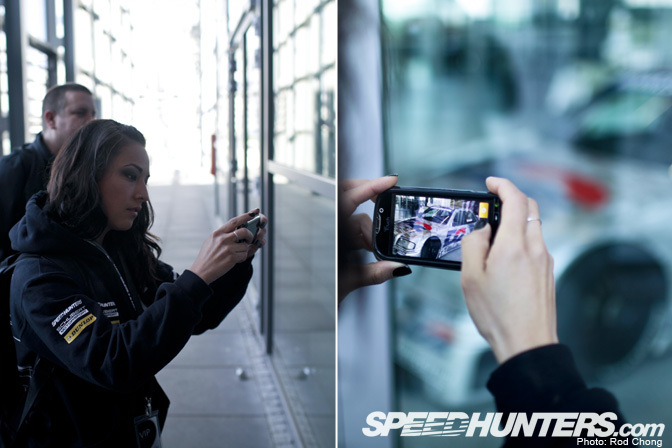 Miki was busy handing out Team NFS and Speedhunters stickers…. 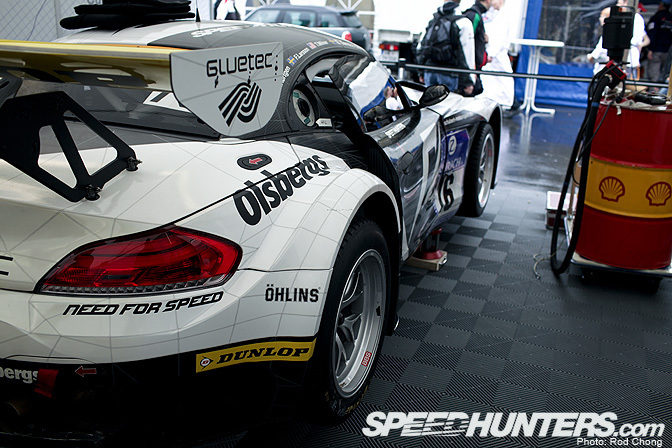 While Andy adorned the number '76 car with one of our Dubai 24H stickers. This isn't the same chassis that won Dubai as it's been sold to Japan, but we thought the sticker might bring us some good fortune. Wish us luck! 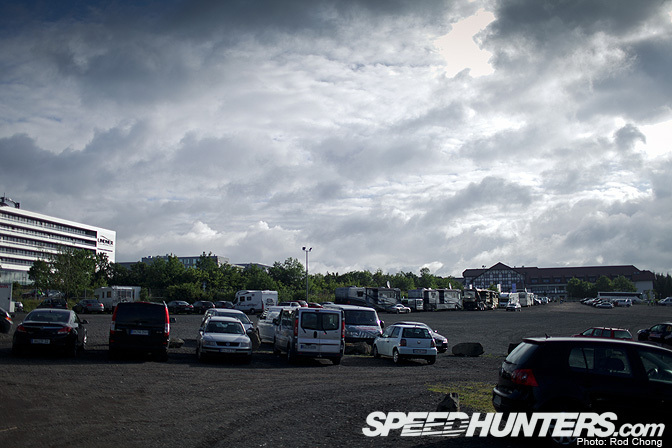 …And I decided to have a wander to do a spot of Speedhunting. 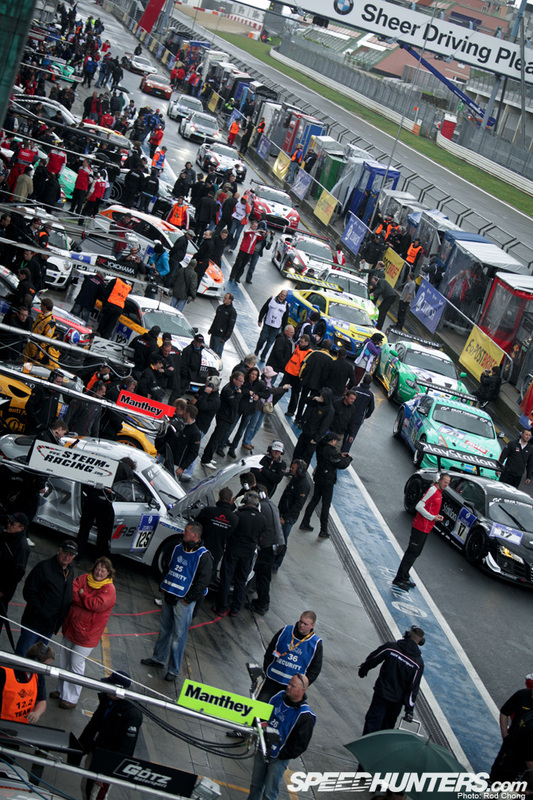 Including the support races, it's estimated there are over 600 cars racing at the Nurburgring this weekend. It's almost impossible for us to keep track of them all! But I thought I'd show a quick snap of this Euro Civic Type R. For me, this absolutely should be the only Civic on sale anywhere. Civics are supposed to be small hatchbacks in my books! 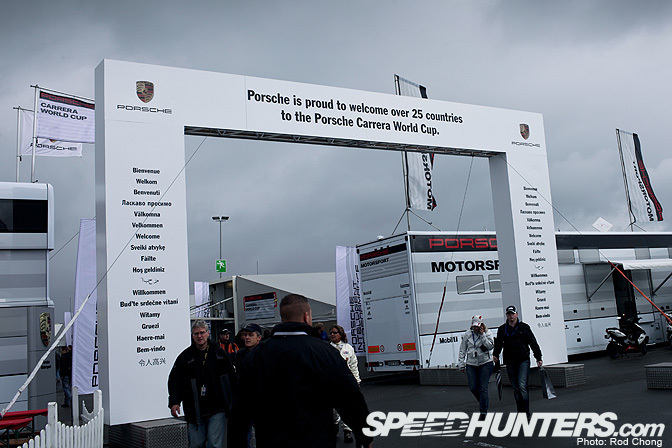 When looking at the N24 event schedule I have to admit I paid zero attention to the Porsche Carrera Cup race listing. But this was until someone told me there are over 160 911s entered in the race! Can you even comprehend that? 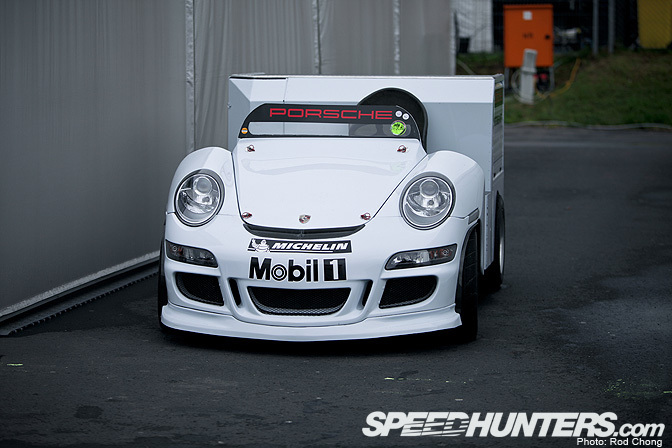 On the subject of Porsches, this is perhaps the coolest golf cart in the world. One of those moments that just calls for a photo to be snapped! Here's a cool street car that caught my eye at the Pirelli compound: a hotted up 1 Series M Coupe. At first I thought it was just running some nice wheels with a bit of suspension work. But a closer inspection shows a full caged up interior. This BMW looked primed as a "Ring Tourer" spec toy! I have to admit to being woefully underprepared for the changeable weather conditions in the Eifel region. I've now been soaked a few times! At least the rain showers make for some good action shots! Check out the driver signatures on this scale section of the Karussell. More info about this Racing for Kenya project is available HERE. 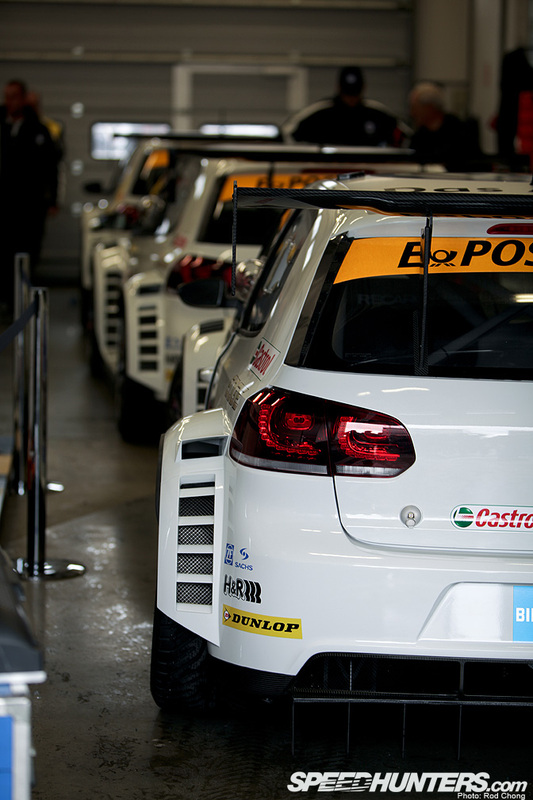 I just can't take my eyes off the new Golf GT24 racers. 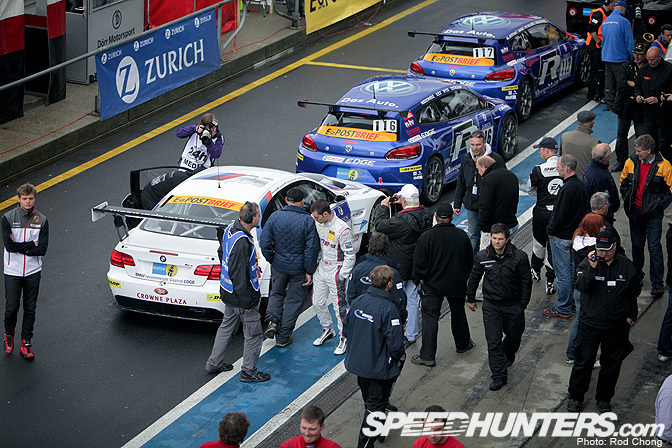 One of these cars is currently qualified in 20th position, in front of a whole gaggle GT3s. That's bloody quick! I'm still in awe at the scale of this event. 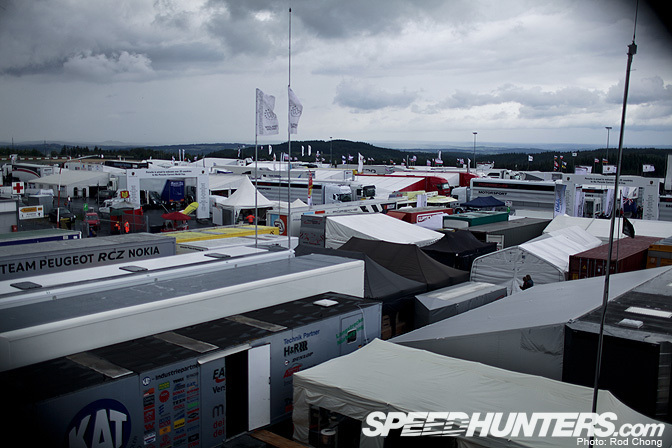 The paddock area is absolutely jam packed with trailers and tents as far as the eye can see. 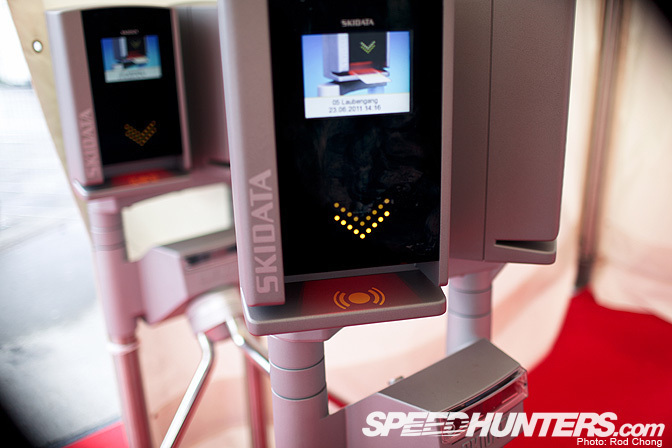 …They come complete with card readers. Unless you have the correct passes, there's no way to get past. 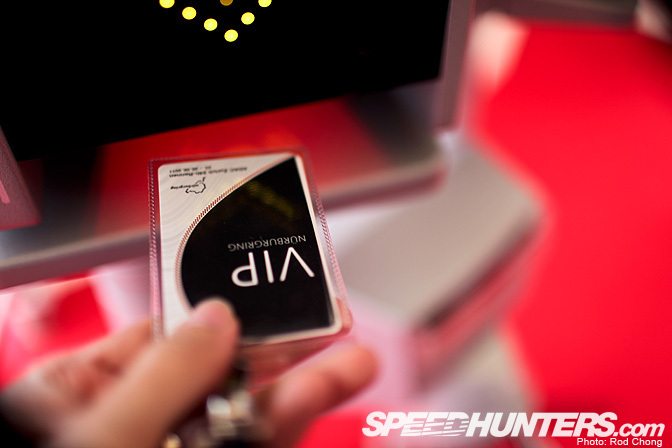 My VIP card (thanks Schubert Motorsport!) allowed me a good vantage point overlooking the pitlane. I was able to set myself up to catch the end of the Classic qualifying session. 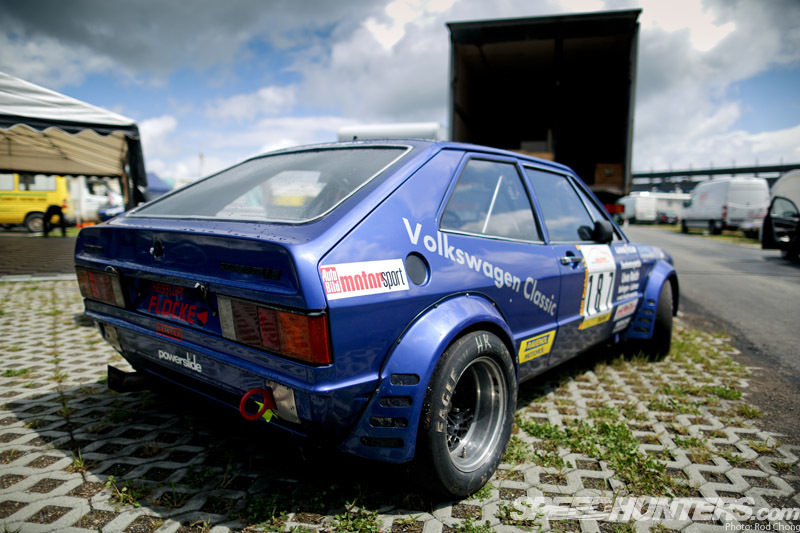 There are some really amazing cars in this field like this Audi 50. 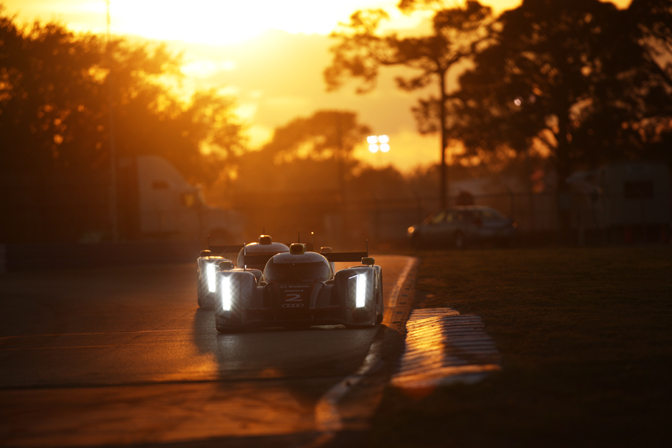 If we can find this car tomorrow in the paddock, it certainly warrants a spotlight! This RSR was painted up like the iconic Pink Pig 917/20. I was chuckling to myself as it rolled down the pitlane. 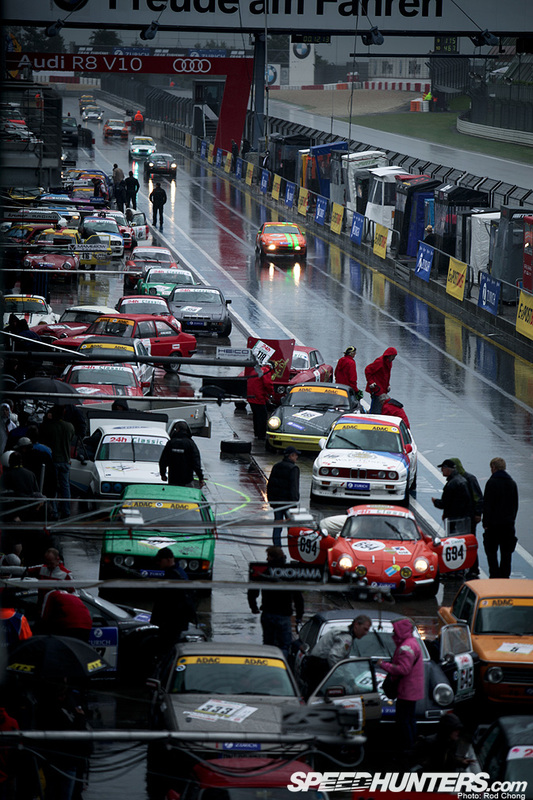 The crew on Radio Le Mans were just saying there are more than 100 cars running in the Classic race! I still can't wrap my head about the scale of this event. As the first official practice session for the 24H race started up, DJ Miki Taka joined me on the roof of the pit building. It may be the end of June here in Germany but the temperature necessitated many layers of clothes. Warm and balmy, this part of Europe is not right now. 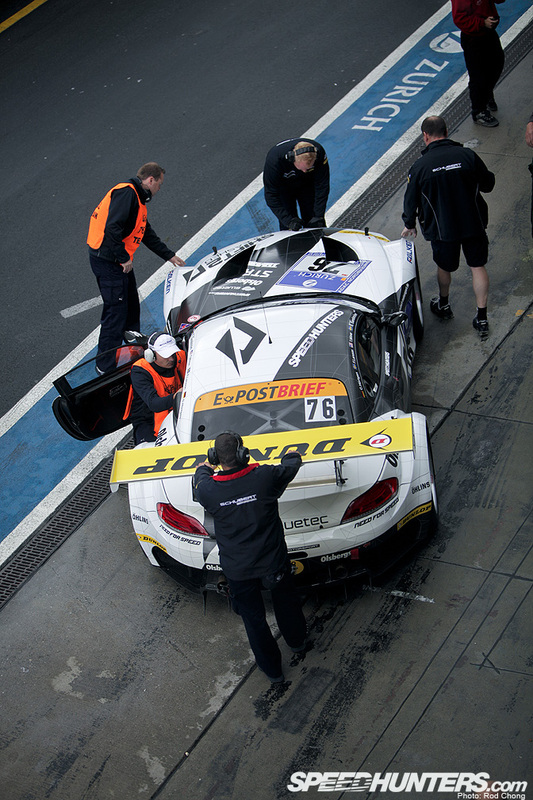 Below us, the Schubert Motorsport crew got the Team NFS BMW Z4 GT3 prepped up for the session. The two factory Sciroccos lined up first, followed by one of the M3s. 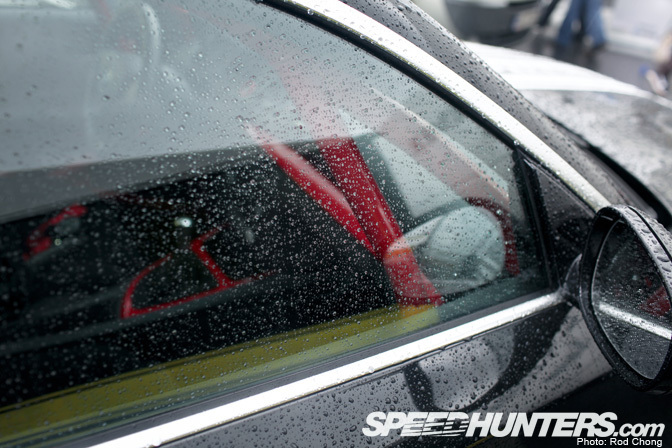 Look closely in this photo and you'll see Edward Sandstrom eyeing up the big Coupe. 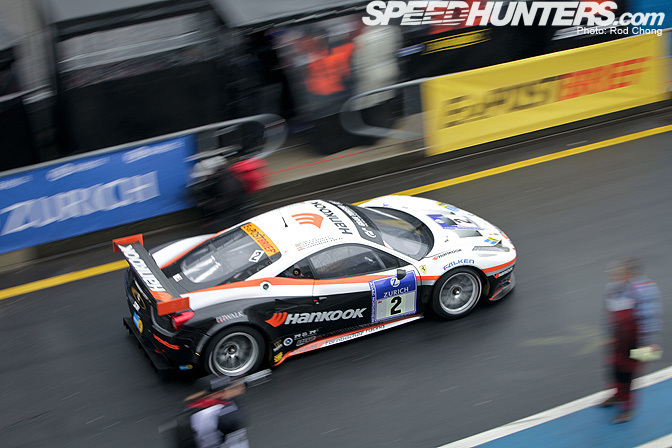 Soon more cars started to get ready, including the Hankook Team Farnbacher Ferrari 458 Italia GT. 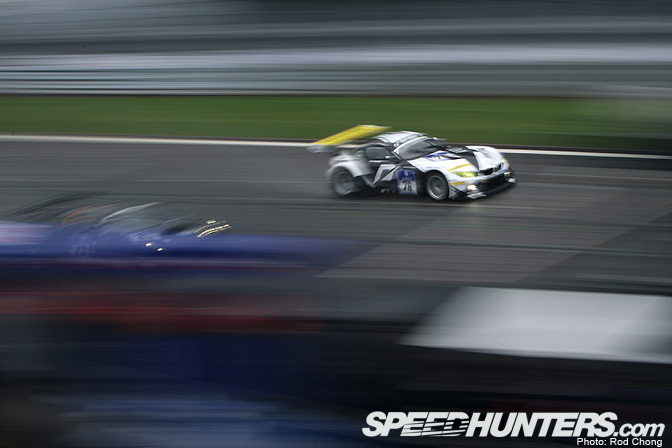 As of tonight, this is proving to be the fastest car in the field, followed by the AMG Mercedes SLS GT3s. That's all from me for today cheers! 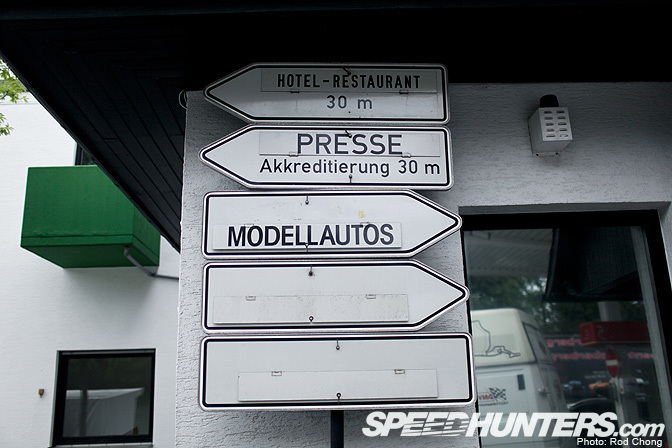 We'll be back soon with more reporting from the Nurburgring 24Hs! Thanks a bunch for the coverage Rod! Great coverage Rod! Love the last pic, so much variety, awesome. 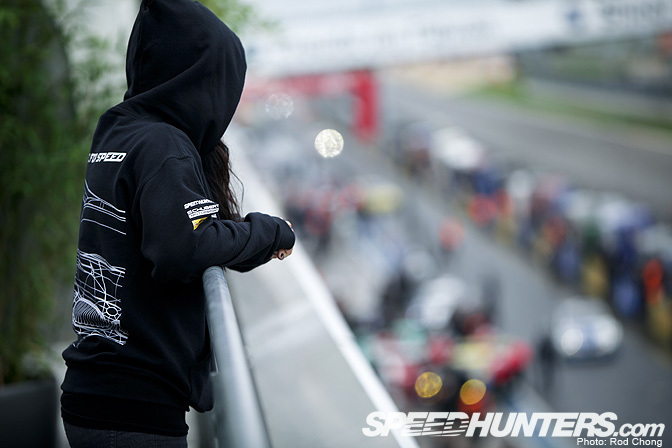 I want that NFS hoodie with the Z4 line art. Where can I get one! She's Hot. If she's reading this, you're Hot. 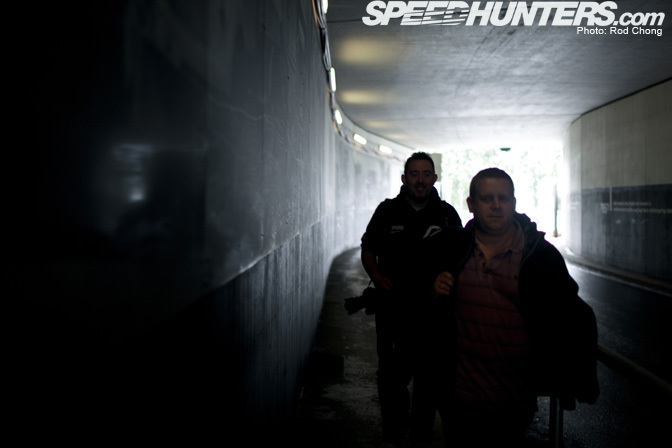 this is going to be one of Speedhunters.com's greatest moments of auto journalism -ever. I'm sallivating all over my keyboard! Please, keep this coverage coming, since a normal speedhead like most of us can't go to Germany and go all over the place in the Ring! What an amazing event! The classic race looks incredible. Can you please supply more info on the Green Focus RS pictured please. is it competing ? 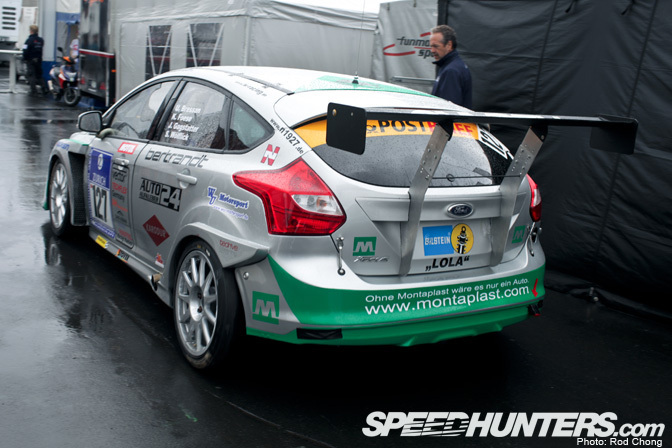 dat green Focus RS... Interesting bodykit!!! Great coverage, love the images. Will be there tonight. Awesome! Rod you having fun... a overload of cars. What!? 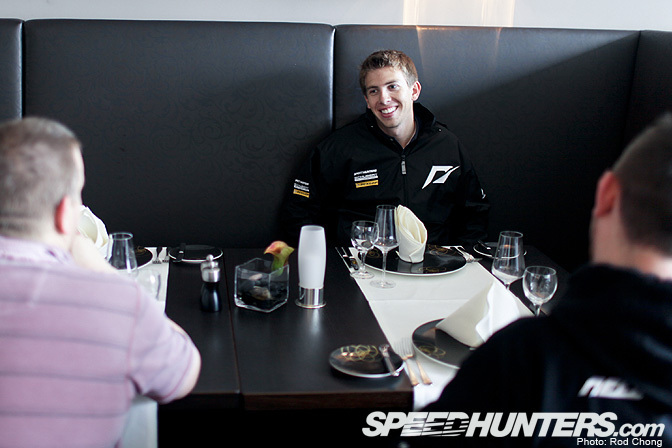 Andy's first visit to die Nordschleife? NSF Hoodies look svelte... i want one like Jon! The gas station is epic! WIth it's 90's look. 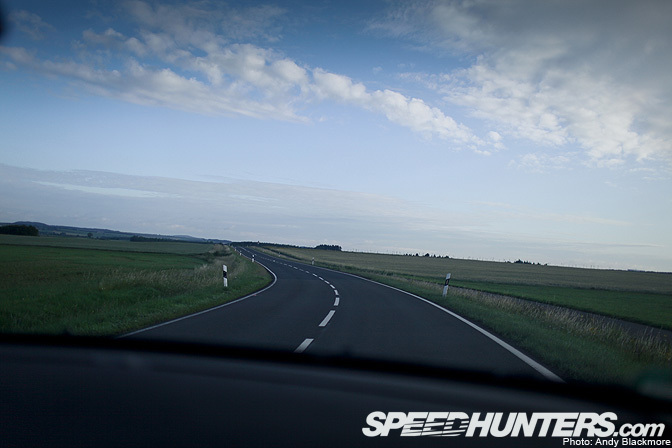 The Eifel roads are awesome to drive, twisty and rolling hills. To bad my car won't allow me to spectate the N24 Race... missing out the P4/5 Competizione, Gazoo LFA's and Aston Zagato amongst others. Aah well there's always 2012. 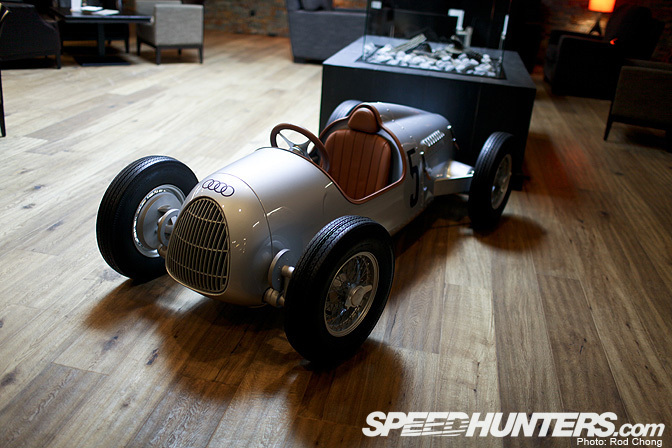 The Audi is actually a pedal-toy for kids. But a test in the AutoBild stated, that this way to overpriced toy is too heavy and too hard to move. Where can i get those beautiful hoodies? They're awesome! Nice coverage guys. 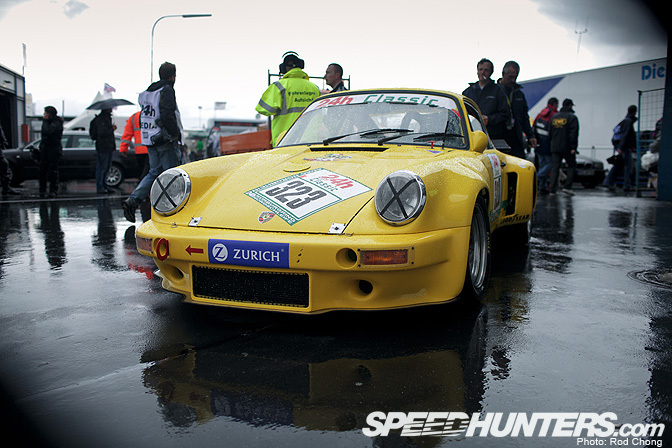 Do you guys have any pictures of the red Alpine A110 number 694 in the pitlane sho - photo 7069?? 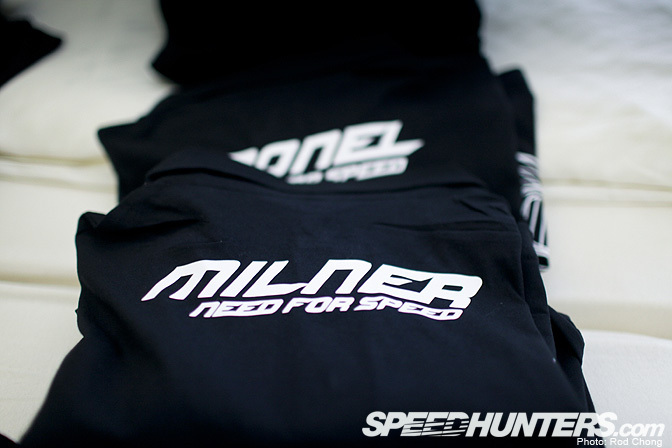 :O where can i get those hoodies?!!! they look awesome i want 1!!!!!!!!!!!! I want one of those Team NFS hoodies.....hella dope! Where can I find those? Does the team have any official gear they put out?? I miss being stationed in Germany. 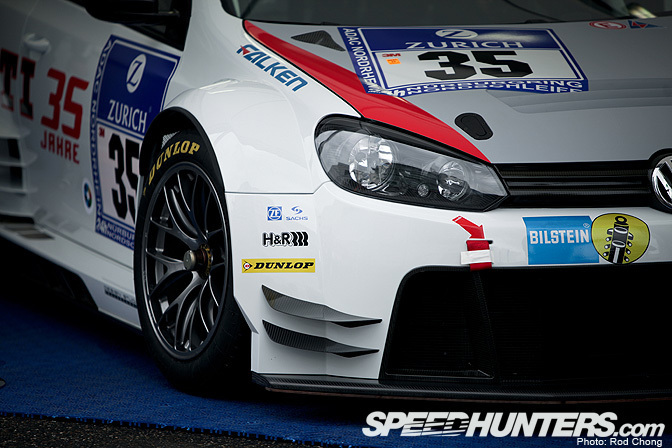 Why do those Golfs have Dunlop AND Falken stickers? Nice post, Rod. Those hoodies need to go on sale!